Our QUADRASTEP® and littleSTEPS® prefabricated orthoses are based on shoe size and knowing your patient’s shoe size will help you to zero in on the correct fit. But you need to double-check the fit on your patient because sometimes people aren’t wearing their correct shoe size and different shoe manufacturers have slightly different sizing. First check the orthotic against the patient’s foot in a non-weight bearing position. If this seems good you then need to get the patient to stand on the orthotic for a final fit check. When someone stands their feet can change size, mostly due to soft tissue expansion, so the final determination on fit is always done with the patient standing on the orthotic. If you’re not certain of fit, feel free to email us some pictures of your patient standing on the orthotic, ideally one taken from behind and one taken from the front, so we can see the arch. We are happy to confirm that you have the correct fit and the correct orthotic and offer any further advice as needed. Our QUADRASTEP® orthotics are available in two widths; regular and narrowed, which are ¼” narrow. The narrow orthotics are designed to fit in cleats and fashion type shoes and generally women tend to prefer the narrow width because it allows them to wear their orthotics in a greater variety of shoes. 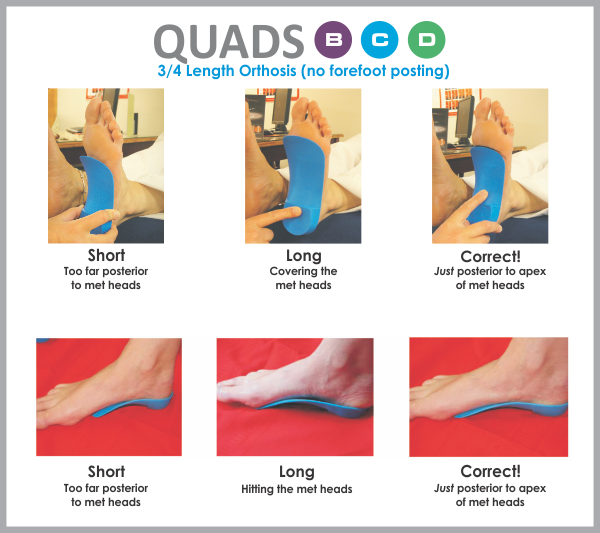 Depending on which Quad your patient needs, the QUADRASTEP® orthotic devices are different lengths, the B,C & D Quads are your standard ¾ length device with no extrinsic forefoot posting. The anterior edge of these devices should end just posterior to the apex of the metatarsal heads. Please refer to our BCD fitting guide. Whereas, Quads A,E & F are an extended length orthotic that comes to the sulcus and these designs have extrinsic forefoot posting. On the A & F designs the 1st metatarsal cut-out should be just posterior to the apex of the 1st metatarsal on the medial side. The E Quad orthotic has a 5th metatarsal cut-out, so it’s best to check that design on the lateral side. The 5th MTPJ should be sitting in the cut-out. Please refer to our AEF fitting guide. QUADRASTEP® orthotics grind easily and it is easy to take them back in areas to improve the fit or change the amount of correction. If you want to make your own modifications it is easier to start with the regular width device and grind back as need to customize the fit. We don’t recommend heat molding because the material has a low melting point and it is easy to damage the devices. If you’re not equipped to do in-house modifications just let us know what you need and we’re happy to customize the fit for you. If you send some pictures of the patient standing on the orthotic and a do foot tracing that will help. littleSTEPS® orthotics are a standard ¾ length orthotic with no forefoot posting so follow the fit instructions for littleSTEPS®. Advise parents that if the child goes up in shoe size it is likely that they will have outgrown their littleSTEPS® orthotic, so that is when they should schedule a time to see you to have the size and fit checked on their littleSTEPS® orthotics. littleSTEPS® orthotics can be heat adjusted for minor adjustments. Please see our How-To Videos to learn how to Heat Flare a littleSTEPS® orthotic. Download our littleSTEPS® Orthotic and Gait Plate Fitting and Sizing Guide. 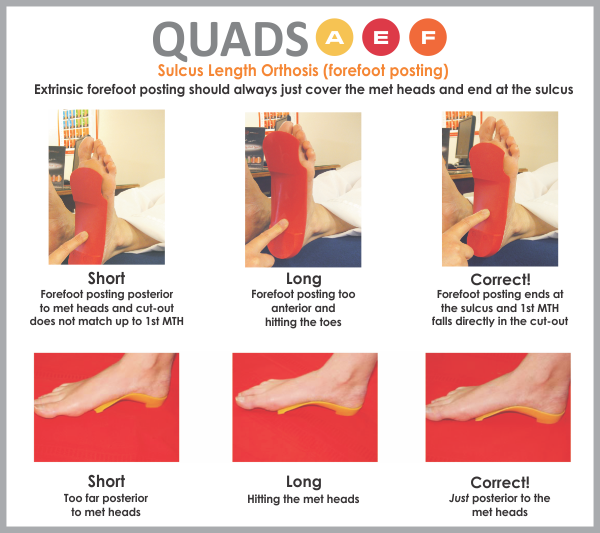 THE QUADRASTEP® ORTHOTIC IS THE RIGHT LENGTH BUT IT SEEMS TOO NARROW, HOW CAN I ADJUST THIS? 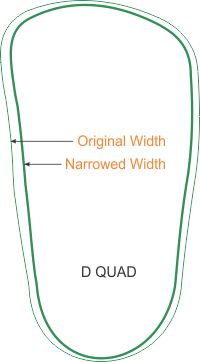 If the QUADRASTEP® orthotic is the right length but doesn’t appear to be wide enough, try the next size up. As the models get longer they also get wider. If the next size width looks good, then check the length, if the length is too long then the shell can be shortened to the right length. If you are not set-up to make orthotic adjustments, we are happy to make these adjustments for you along with many other customizations as needed. Just note which size QUADRASTEP® model is the right width and then note how much needs to be taken off to make it the correct length. Our QUADRASTEP® orthotics are available in two widths: Regular or Narrowed. The Narrow orthotics are ¼” narrower and are designed for cleats or fashion shoes, and often work better for women or people with narrower feet. As a general rule your patient will have less shoe fit problems in a Narrow orthotic. Just keep in mind that if you reduce width too much you can reduce function, so an assessment needs to be done to make sure that the fit is correct and function hasn’t been compromised. CAN I ORDER A QUADRASTEP® ORTHOTIC IN A SIZE 0? YES! We can cut any QUADRASTEP® orthotic to a size zero. There is no additional cost but we recommend a Topcover for asthetic purposes. CAN I ORDER A QUADRASTEP® ORTHOTIC IN A SIZE 15? The answer is mostly no. The C & D Quads are the exception as they fit a female foot up to size 15.5. We are not able to accommodate a male foot size 15 at this time but we can recommend an excellent custom orthotic lab as an alternative. 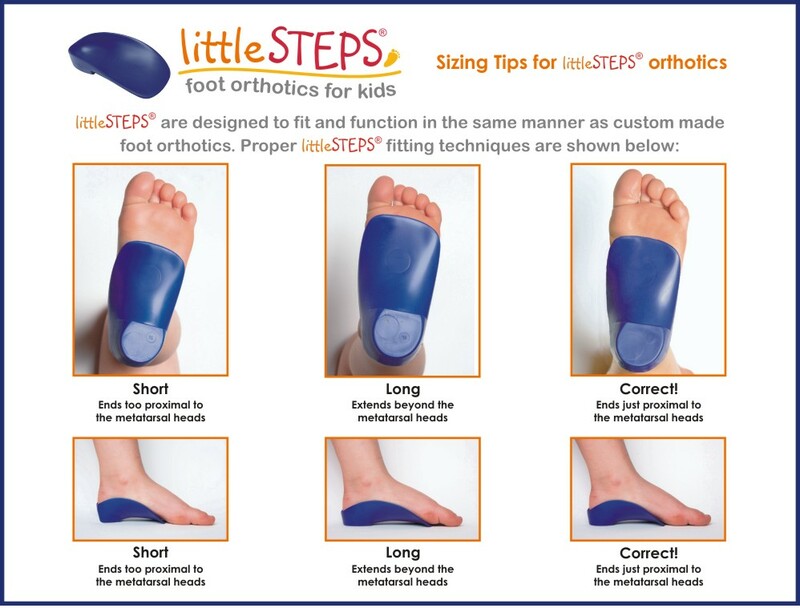 THE littleSTEPS® ORTHOTIC IS THE RIGHT LENGTH BUT IT SEEMS TOO NARROW, HOW CAN I ADJUST THIS? If the littleSTEPS® orthotic is the right length but doesn’t appear to be wide enough, try the next size up. As the models get longer they also get wider. If the next size width looks good, then check the length, if the length is only slightly too long then we recommend you leave it alone as the child will likely grow into it rapidly. If it is way too long, estimate how much too long, 1/8” or 1/4” and the shell of the Little Step orthotic can easily be cut or ground shorter, so it’s the right length and width. If you are not set-up to make orthotic adjustments, we are happy to make these adjustments for you along with many other customizations as needed. The littleSTEPS®ORTHOTIC IS THE RIGHT LENGTH AND WIDTH, BUT IT SEEMS A BIT TIGHT AROUND THE HEEL CUP, CAN THE HEEL CUP FIT BE ADJUSTED? The littleSTEPS® orthotic heel cup can be flared out with a heat gun to make it wider (please see our How-To Video page). If you’re not set-up to make this adjustment, we can do this for you. Let us know if there is a particular spot where it seems too tight, for example the lateral heel cup. Or take a picture of the child's foot in the orthotic and email it to us, so we can visualize exactly where and how much to flare the cup. I HAVE A PATIENT AND THE littleSTEPS® ORTHOTIC LENGTH IS CORRECT BUT THEY HAVE NARROW FEET AND THE DEVICE SEEMS TOO WIDE, ESPECIALLY AROUND THE HEEL CUP. CAN I ADD A TOPCOVER TO REDUCE THE WIDTH? Adding a topcover is a good way to fill up the heel cup for narrower feet. You can add 1/16” EVA topcovers (snugs up about 1/8” total since you are covering both sides of the heel cup); or 1/8” topcovers which snugs up about 1/4” total. So, just estimate how much snugging you need and let us know if you’d like us to add a topcover for you. 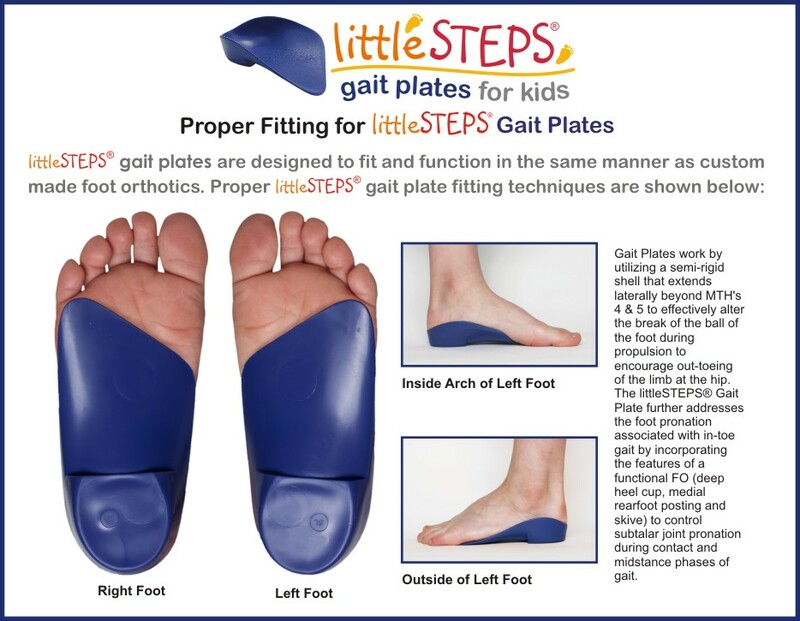 CAN I GET A littleSTEPS® GAIT PLATE IN A SIZE 8? Vo, we only make Gait plates up to a youth size 5.5. If you have remaining questions on how to fit your QUADRASTEP® or littleSTEPS® orthotics, you can refer to our FAQ, and if you do not find answers there we are happy to answer any questions you have or view pictures/videos to help you choose the correct fit or orthotic.